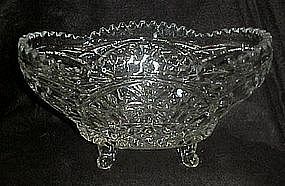 Take a good look at this lovely oval shape lead crystal fruit bowl. It is stunning the way the light reflects off the pattern. Made of highly polished lead crystal and has a pattern of flowers and arches. Sits on four dainty curly que legs. Measures 4 1/2" tall and is 9" long. Pristine condition. Would make an impressive gift.